I travel a lot for work. I spend two out of three days away from home on average. But I’m not prepared to go without cycling for any length of time. 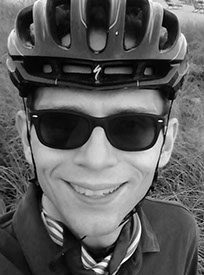 I have tried renting bikes, but I’m so tall that I rarely find a frame that fits me, and most rental bikes are a nuisance anyway. Now I travel with a bike that was made for me. Thanks to high-end butted Columbus tubing, it’s as light as a feather despite its size. And thanks to a pair of S&S couplers, it fits into a suitcase. I’m aware that it’s an extravagance, but I love it. It’s my home away from home. To keep it simple, I have opted for a single-speed setup with a 48t chainring and a 16t sprocket, resulting in a 3:1 transmission – perfect for cruising in flat terrain, but not great for climbing. As it happens, I’ve been stationed in Monaco for a while now. I’m not complaining, but flat terrain is hard to come by in these parts. There is the Corniche, the coastal road, but it’s so congested that those who can afford it rely on helicopters to get around. Pretty much all other roads take you up and down the foothills of the Maritime Alps – scenic, but hard on the knees with a 3:1 gear ratio. So I’ve been looking for alternatives, and I struck gold in nearby Italy. 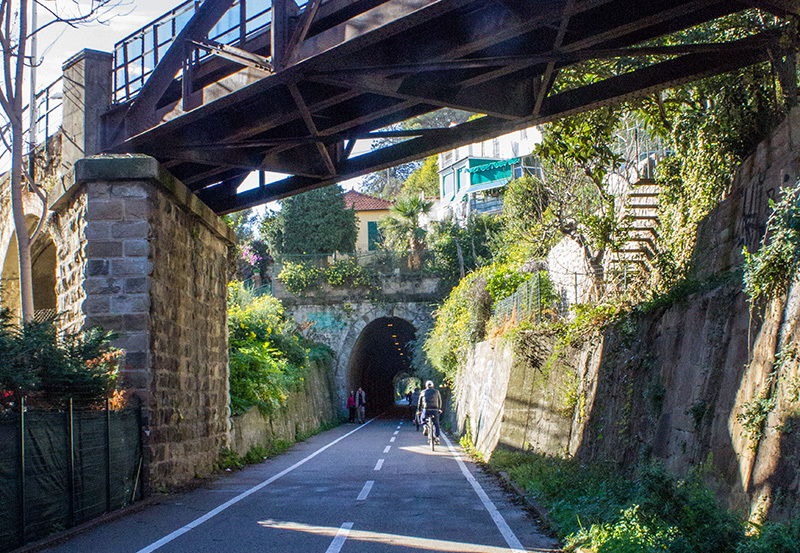 Officially, it’s called the Pista Ciclabile del Ponente Ligure, Cycle Path of Western Liguria. It follows an old railway line that now runs underground. The great thing about train tracks is that the maximum inclination is four degrees, simply because there is not enough friction between a train’s wheels and the rails to master anything steeper. No matter how strong the engine, the train would simply slide down the track. Suits me. As soon as you get on the path, you’re in another world. The pista starts in Ospedaletti, a stone’s throw from Ventimiglia station and a half- hour train ride from Monaco. As soon as you get on the path, you’re in another world. First of all, there is no motor traffic. It’s strictly cyclists, skaters, and pedestrians only, and there are very few intersections with regular roads. To the left, the peaks of the Ligurian Alps are looming in the distance, some of them capped in snow if you’re riding in winter or early spring. To the right, the Mediterranean is gently lapping on the shore. Every few miles, you can stop at one of several path-side coffeeshops for snacks and drinks. This being Italy, people are friendly, the food is great, and the espresso is impeccable. If cycling were a creed, this tunnel would be its church. Before long, you will find yourself in San Remo, celebrated for its medieval cathedral and sprawling gardens. But if you’re like me, you’ll keep riding. It’s just too much fun. To the East of San Remo, the path enters the tunnel under Capo Nero, the Black Cape. This tunnel, pleasantly cool and brightly lit, is perhaps the most touching part of the path. It celebrates great riders, from Fausto Coppi to Eddy Merckx, and chronicles epic moments in the history of the Milano – San Remo race on oversized displays suspended from the vaulted tunnel ceiling, complete with captions painted right onto the path. If cycling were a creed, this tunnel would be its church. The bad news? The path is much too short. Even if you ride at a leisurely pace, it won’t take you more than two hours to cover its entire length and reach San Lorenzo al Mare in the East. My advice? Stop by Gelateria La Playa for delicious home-made ice cream, then turn right back around. Repeat as needed. Side effects? A smile that’s wider than your head.